You can now find information about the London Conference in Critical Thought at londoncritical.org. The 2013 conference is finished, and it was a success. Thanks to all who attended and whose conversations made the days so valuable – and especially to everyone who presented. Thanks also to all the stream organisers – without their input there would be no conference. There are a few people who should be named especially for their contribution – Matt Mahon, Sam Wilson, Victoria Ridler, Henry Somers-Hall, Aileen Robinson, Liz Haines, Lucia Vodanovic, Victoria Browne, Dan Matthews and Caroline Williams, for organising behind the scenes for nearly seven months. And finally, to Nathan, for hosting us at Royal Holloway and making the conference possible. We’re going to be doing some work over the summer to make the LCCT more sustainable, and to get the London Critical journal up and running. Keep an eye out for the call for papers – we’ll prioritise material from the conferences. We’re also going to make all the recordings available as soon as possible. If you made a recording that you think we might not have, please get in touch with us – we’d love to host a copy on our site. We’ll be meeting in October to begin planning for the 2014 conference. Watch this space! LCCT 2013 Programme. At the end of the document is a chart showing which streams are in which rooms; abstracts will be published shortly. Abstracts are now available here. Registration is free but essential. 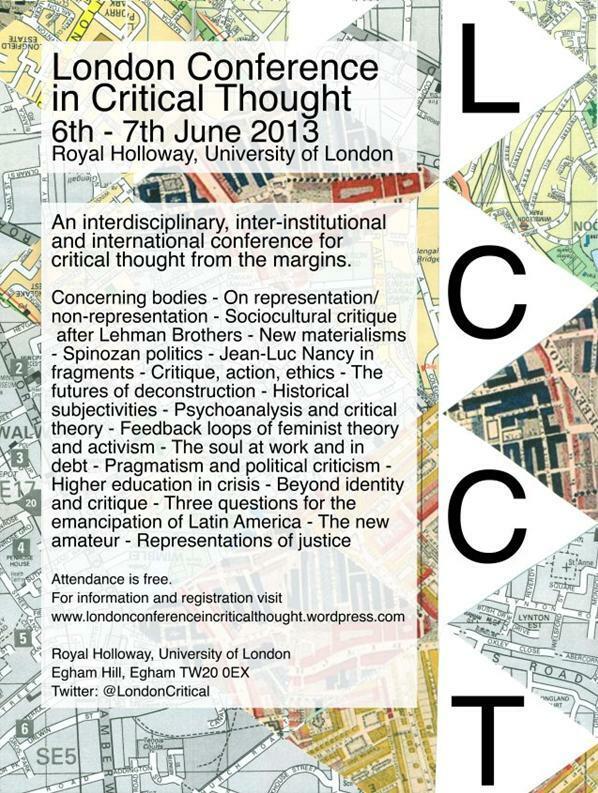 The second annual London Conference in Critical Thought (LCCT) will offer a space for an interdisciplinary exchange of ideas for scholars who work with critical traditions and concerns. It aims to provide opportunities for those who frequently find themselves at the margins of their department or discipline to engage with other scholars who share theoretical approaches and interests. Participation is free (though registration is required). The conference is divided into thematic streams, each coordinated by different researchers and with separate calls for papers, included in this document. We welcome paper proposals that respond to the particular streams below, as well as papers for inclusion in a general stream. Touching on broad themes – including the relevance of historical theories today, responses to the crisis, the body, subjectivities, and praxis and action – these streams provide the impetus for new points of dialogue. Central to the vision of the conference is an inter-institutional, non-hierarchal, and accessible event that makes a particular effort to embrace emergent thought and the participation of emerging academics, fostering new avenues for critically orientated scholarship and collaboration. Please send papers/presentations proposals with the relevant stream indicated in the subject line to londoncriticalconference@gmail.com. Submissions should be no more than 250 words and be received by the 25th March 2013.